I am a big believer in the “regression to the mean” concept, see for instance my recent blog on ConocoPhillips (COP). In essence it is an approach that smooths out all the silly extremes, both above and below the line. In this particular case the line itself is adjusted to inflation, such that the impact of the diminishing value of the measuring stick, that is the US$ is taken out of the equation. Also the regression is fitted to an exponential equation – think hockey stick – as this is the norm for most “growth” phenomenon like the stock market or world population growth. This chart tells you a lot of wonderful things! For one, the market is, roughly speaking , above the line as often as it is below. This is a logical consequence of what the line represents, the mean. This above or below is the variance which is depicted in the lower part of this chart. 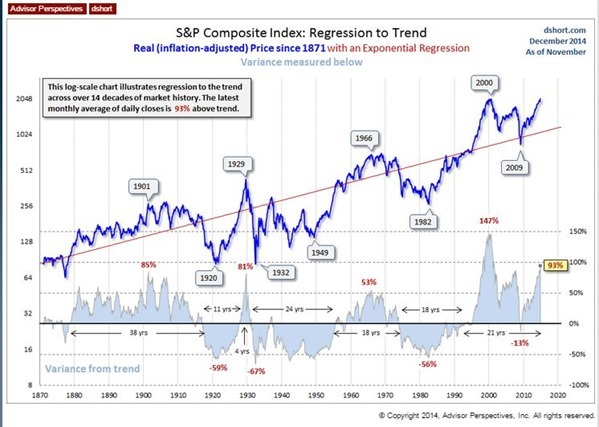 At the past stock market peaks it had trouble getting to 100% with the only exception being the tech bubble of 2000. At the other end 60+% below the line is about as bad as it gets. By the way, note that the Great Recession barely registers in negative territory, perhaps it was just a fabrication by the “shock and awe” crowd. Presently the S&P is at 2075 and is 93% (at the time of writing) above the line, a clear indication that the market is grotesquely overvalued at least in historical terms. So if it were to fall to the mean it would be at around 1075. But since the pendulum never stops at the center, it would probably swing on and lose about 60% just to equal those previous occasions. That would bring the S&P to 430, equal to a total drop of 79%! This is all in the blog dshort.com which is well worth reading and highly recommended. No EW here!